After a cold and frosty start to the morning we headed for Exeter Racecourse full of anticipation for the South Devon Quilters meeting. Coffee first then a look around the stalls saying to ourselves “we do not need anything” but who can resist some more material etc to add to the stash. The traders this time were Cowslips, Bits and Bobs and Wellhead Books. I have always liked the paintings of villages and towns where the houses are all on top of each other so to see them put into quilt pictures by Brenda Thomas our morning speaker was lovely. Such patience and attention to detail. I loved them – enough to think I might have a go of a holiday snapshot – and the post card strip was such a lovely way to bring back memories of holidays enjoyed. No doubt many of you were inspired as well. As a late starter to quilting Brenda has certainly caught up. 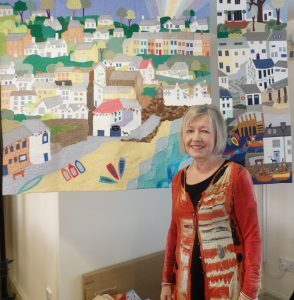 Before we broke for lunch our show and tell was of individual quilts from members, the regional quilts from the Cornish members, plus the “Up Up and Away” challenge quilts which had been around the country with Grosvenor since the beginning of February. There was also a fashion parade by members of their lovely patchwork waistcoats. A wide selection of finger food was provided by members for our lunch. What a selection! Topped off by Dorrie’s Christmas cake. Thank you ladies! 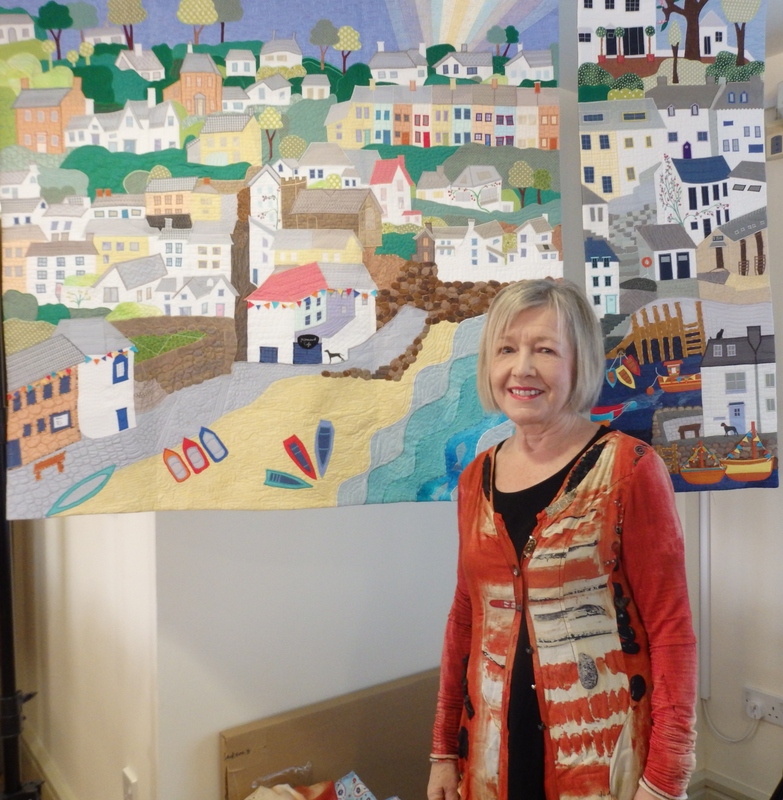 We reassemble for an illustrated talk “Journeys in Stitches” by Gillian Travis. Gosh what a travelog she gave us. Each illustration was the photograph and the picture quilt made from it. A world tour in quilts. Gillian said she has over 500 quilts. Gillian explained that she took photograph whilst travelling and then on returning to her studio she creates quilts using fabric, paint and stitches. Perhaps not the way most of us think of quilting but the work involved was appreciated by all present. Giving an illustrated talk as she did today we were able to see many more examples of her work. To take 500 quilts around to meetings would be rather an impossible task. Thank you to both our speakers. The day closed with the Raffle and notices. 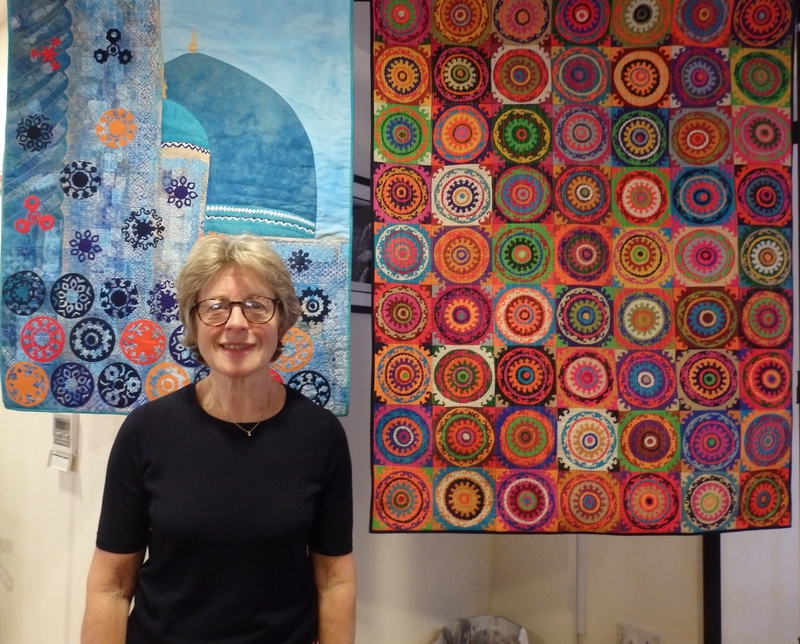 What an interesting and inspiring day in lovely surroundings plus the chance to catch up with friends and fellow quilters.